The first thing that popped into my head when I heard of the Viz app was, honestly, "aw, man, another discrete app? I already have half a screen of various comic reading apps!" Thankfully, the app more than makes up for this minor complaint, as I will outline in this review. The reason for this appears to be that Viz wants to tie the user up with a vizmedia.com account rather than putting its inventory on one of the other comic book marketplaces — presumably in order to collect market data and directly monitor usage. Signing up for such an account is the first thing you have to do in order to view any of the manga, adding yet another login and password to your life. Thankfully the process is very swift, asking a minimum of questions and requiring only an e-mail activation to complete. The layout of the app itself follows the normal mold for iPad comic apps that has now been established by comiXology, with a grand total of three viewable tabs, one each for the store, your library of content, and the settings. The app feels greatly streamlined with very few settings available to the user, although it must be noted that I did not find myself wanting for anything and found the app easy to navigate. The library itself is also very streamlined, with six titles available, each with one to two volumes available at present. 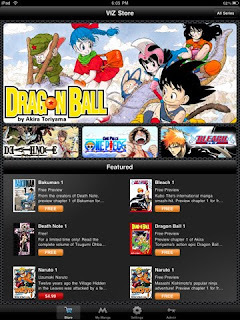 These titles are Viz's biggest, such as One Piece, Dragon Ball and Naruto. Each series also has the first chapter available to preview for free, which is a welcome feature. The title-browsing interface is very simplistic and I hope that this is developed further as more titles are added — while the interface works fine for six series it could quickly become cluttered and difficult to navigate as more are added. As a gift, the first volume of Death Note is available to download for free to users who sign up for new accounts (at the time of writing). Downloading is as simple as pressing the appropriate link and letting the data come to you — however sadly this is marked with a few problems. First of all, there is no downloads menu — the only indication that anything is happening is a sluggish blue bar pasted at the bottom of the volume cover which you can sit and watch creep across the screen. You cannot view a volume that is being downloaded, something that is easily possible on other (sadly less scrupulous) manga viewers. You are still free to navigate around the app, but the experience is noticeably slower and there is a lack of anything else to actually look at while you wait. Exiting the app causes the download to reset, which is irritating but is perhaps more due to the fact that iPads are still running iOS3.2-OS4.2 and multitasking will not be available until some time in November according to Apple. Re-entering the app automatically restarts the download, which is a nice touch, but as downloads don't show up in your library until they are finished and there is no downloads pane, it’s a rather long-winded process to determine how your download is doing. For my part, I went and played with my cats while the download was ongoing. One thing I want to quickly praise here is the error messages. This sounds like an odd thing to mention, but each time I ran into an error with the app (not often), the message presented was clear, direct, and to the point. When I bought and downloaded Volume 1 of Bleach to test the purchasing system there was an error with the download. The message that appeared reassured me that all was well, nothing was lost, and I only had to restart the app. This extra effort is greatly appreciated, as when errors of this sort occur it can be bewildering as to where your money and content have gone. So, enough of all of this infrastructure stuff — what about the actual comic-reading part of the app? First of all, the image quality looks fine. Even when zoomed in the pages look clear and legible with no artifacts in sight. Holding the iPad in landscape mode creates a two-page spread that mimics a physical manga volume, while holding it portrait gives you a view of a larger single page. Both work well and are comfortable to read — the biggest compliment I can give is that I happily read the entire first volume of Death Note and Bleach with no major issues. One nice thing that made me laugh is that the generic "you are reading the wrong way!" advisory message you find on the last page of manga volumes pops up when you try and turn the first page as if you would a western book. These touches show Viz has been thoughtful when constructing the app. There are still small niggles with the presentation, however — reading landscape introduces a small time lag in-between page turns as the app renders the next two pages ahead of you, and skipping to a distant portion of the volume causes the app to tick over for a noticeable amount of time before displaying the desired pages. However, It should be noted that this behavior was only apparent when I stress tested the application. Another small complaint with the manga viewing, at least with Bleach, is the massive size of the spine margins present on the pages — in either landscape or portrait view they take up a not-insignificant portion of the screen and once you see them you can't help noticing that they are there. Cropping these would really benefit the reading experience. Prolonged reading was comfortable on the eyes, but sadly not on the arms — the iPad is still just a little too heavy to be fully comfortable as a reading device, but this is a fault of the hardware and not Viz. A quick note here on the price: US $5 a volume at present. This feels, to me at least, a very fair price to charge with the caveat that I expect purchases to carry over onto other digital platforms as they become available. I see no reason why not as your purchases are tied to the Vizmedia.com account you have to create when you start using the app. All in all, the app does what it says on the proverbial tin, in an approachable and streamlined manner. I have no real complaints that would prevent my continuing to use the app, other than a frank request that they port it to other territories ASAP — if this was available natively in the UK I would gladly use it to finally buy and read One Piece. The series is just too big at present to buy in physical format due to the sheer bulk of the books. I hope Viz continues to improve the app; adding more and a greater variety titles would be a great start, but adding in community interaction such as forums, reviews and such would really boost interactivity and provide something to do while waiting for downloads to complete. For now, though, it’s a great start. Note: This review is of the first publicly available version of the Viz Media iPad app, and thus the app itself is liable to change via updates and patches. Please also note that this app is only available at present within the US and Canada — being in the UK I had to obtain the app via gray market means which, while relatively easy, should only be attempted if you are fully aware of the possible drawbacks of such an approach.